A plague of tiny metallic green drones lay eggs into moist skin folds and they hatch into wriggling flesh-eating larvae causing global carnage. Millions are dead but we fight back with an arsenal of harsh chemicals, but the aliens keep adapting. Some people take drastic measures by surgically removing skin folds, even resorting to painful castration. It reduces the problem but doesn’t eliminate it. The main character fighting the aliens is Clare, a young scientist teamed up with an international SWAT team searching for the alien’s Achilles heel. A blockbuster? Yes! But is it a science fiction story? No! This is a true story, the alien here is the insidious blowfly Lucilia cuprina and the carnage occurs in sheep. And Clare and the scientific SWAT team are real too. 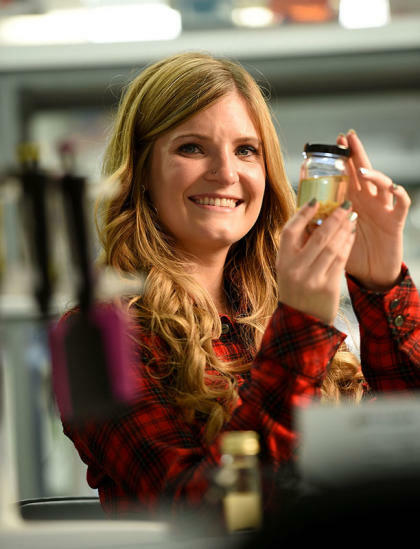 Dr Clare Anstead is a 29-year old Canadian from the prairies of Saskatchewan, who joined the University of Melbourne in January 2014 to work on the international blowfly genome project. Truth is always stranger than fiction. The parasitic fly lays its eggs around the sheep’s bottom, genital area or open wounds causing hideous inflammation, toxaemia and millions of deaths a year. The problem is this sneaky fly continually evolves, resisting new insecticides applied to the sheep. The alternative is mulesing, a surgical slicing procedure around the tail which sometimes includes the other type of lamb chop, but it’s controversial and animal welfare groups are keen to ban it. “This fly is a master at evolving and becoming resistant to insecticides and there have been huge research efforts in prevention and control ranging from developing vaccines, new insecticides and even biological control with bacteria and fungi but they have not been effective,” said Dr Anstead. If we could think of the scientific battle against blowflies as three strikes and you’re out, then Clare and the team have just pitched strike one. The research is funded by the United States National Human Genome Research Institute and Australian Wool Innovation. The international research team is led by the University of Melbourne and has utilised the best specialist laboratories around the world. The cultures of blowfly larvae are grown in a special containment lab in Queensland, they are then turned into a milk shake and the DNA was sequenced at the Baylor College of Medicine Human Genome Sequencing Center in Texas. Meanwhile, samples of RNA, the molecule which is generated from DNA and tells the blow fly cells what proteins to make, was sequenced in another Queensland lab to find out what active proteins are made by the blow fly, as a way to double-check the predicted gene set. Dr Anstead and Melbourne crew receive the raw data and decode the genome using a combination of supercomputing and bioinformatic techniques to handle huge reams of data. Everyone’s expertise is involved in crunching analysing and making sense of the data. 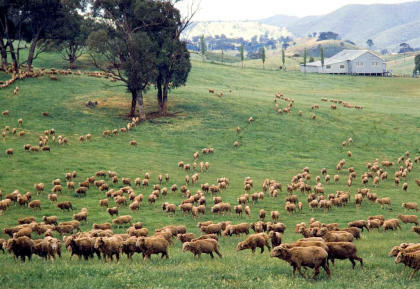 New Zealand has about seven times as many sheep as humans, in Australia its about three to one - we have about 10 percent of the world’s sheep. Clare works with Professors Robin Gasser, a nematode expert who is Principal Investigator of the parasite genetics and genomics lab, and Phil Batterham, a fly geneticist in the Department of Genetics at the Bio21 Institute. They are already gearing up for strike two to blowflies. Using the computer data, Phil and his team created a transgenic fruit fly with a blow fly gene and predicted that gene could be involved in insecticide resistance. Scientists like Dr Anstead have a passion for science and fascination with investigating these parasites. As a kid, I was always brought bugs in the house and adopted every single stray cat. I wanted to be a vet, but then I took a parasitology course at university and found these sneaky parasites to be fascinating. “Before blowflies my favourite parasite was the tick, I studied them for my PhD. Tick collecting involved crawling through the bush wearing big white suits and we would come out looking like a Dalmatian and have to pick them all off. But there was always a sneaky one you would find in the shower the next day behind your ear, along your belt line, or under your shoe strap. So as you snuggle into your cosy woollen jumper give a nod to the sequel of this saga, where Clare and the blowfly SWAT team are on the case. CRISPR, biology’s methodological wunderkind, is becoming synonymous with the controversial field of human gene editing. But it’s revolutionising much wider scientific discovery too.